And, on that horse�constantly ride? I guess we�d take that in our stride. And, we�d not think it strange. He was as handsome as could be. And, he�d happily�take her anywhere. Yes, they thought it would never end. And, to their truck�he was led. And, she didn�t even hurry. But, �Prince��racing back to his abode! 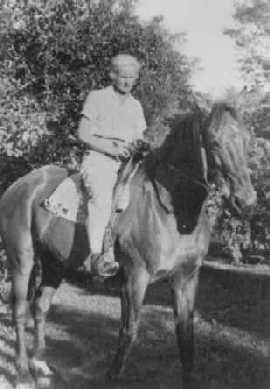 Aimee's Gramma Taylor on her horse.